Why waste time clamping things down when you could achieve the same level of security by using these handy little triangles? They are called Grabbers because that is just what they do. These sturdy project supports are rubberized on both sides to create a highly efficient non-slip surface. When placed onto a counter or workbench they don't move. Place an object on top, and it becomes just as immobile. No longer is it necessary to clamp things down in order to achieve precision when sanding, drilling, gluing or other jobs because these affordable little guys will do the job just as well, but with way less time and effort involved. They can be used on their own, or along with Painter's Pyramids or the VersaSpin 360 for even more usefulness. Elevate your work, and prevent it from moving in order to save time, achieve a higher level of precision, and make all of your projects easier to finish. When the object you are working on is elevated, more work area will be revealed, but it will also make it easier to access all parts. When the object is unable to move, you never have to worry about slipping or sliding, so you will be able to work more efficiently and end up with a more professional finish. Small mistakes and accidental errors will be all but eliminated, and jobs where pressure is applied, and objects are prone to moving will be greatly simplified when you have these in your toolbox. Chisel without chasing the board, drill without anything spinning, and sharpen knives with the highest level of accuracy. Forget about searching for the right size clamp, setting it in place, and then worrying about how it might ruin the object you are securing. 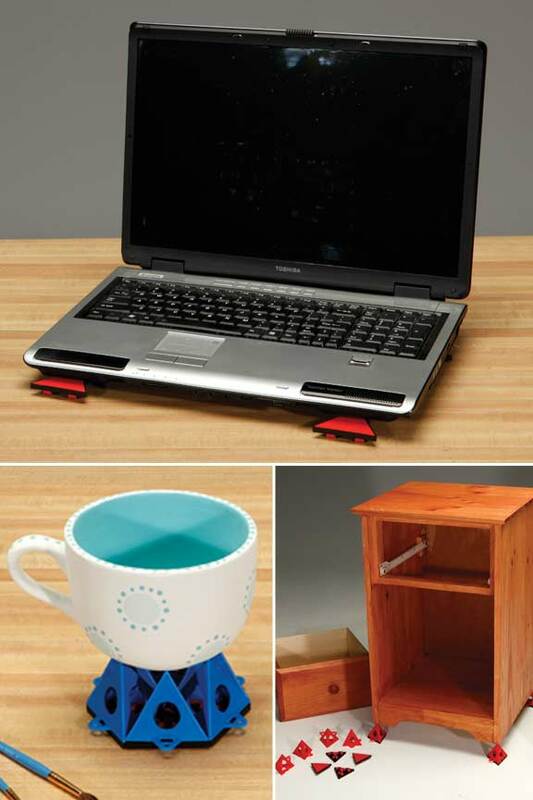 Just toss a few of these down and rest your object on top for the ultimate way to stop moving objects while repairing, crafting, building, painting, sanding or anything else. These things are great all by themselves, but when paired with other products, they can offer a whole new level of usefulness. Attach to Painter's Pyramids, the VersaSpin 360, or Gliders for more versatility and possible applications. Just pop a Painter's Pyramid on top and it will fit securely over the top in order to form a Pyramid with a non-slip base. This will allow you to use the Pyramids anywhere and they will stay in place without being screwed down. This will elevate your object higher, and allow it to rest on an extremely small, non-stick surface. You can rest freshly painted objects on top without worrying about ruining your work. Attach to a glider for a triangle that is friction free on one side and high friction on the other. Stick underneath a heavy object to grip the object while reducing tension with the floor. It can now be moved with less strength and effort. Use this same technique for several other applications. Grabbers come included with the VersaSpin 360, but you can always add more for increased value. They will allow you to place objects on the turntable and make sure that they don't move. 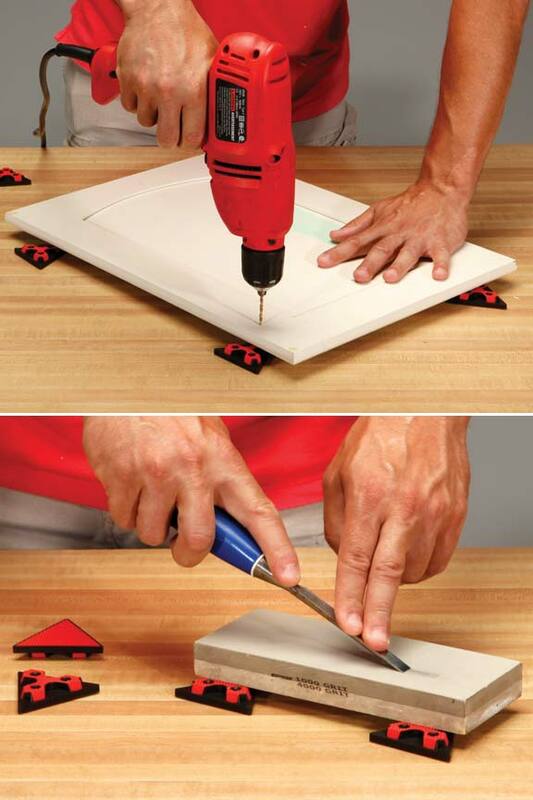 This is perfect for things like cake decorating and flower arranging, but can also be nice for simple stuff like sanding a cabinet door. Secure an object in place and then spin it around to access all sides without moving. Just because you have used traditional tools in the past does not mean that you should waste another minute using them again. You don't have to chase pieces of wood that slide away from you, or deal with mistakes brought about by and unstable working surface. Increase your perceived skill level while reducing the time it takes to finish the job. Don't use old school clamps and other methods of immobilizing your work. Simply set down these, and lay your project on top for an incredibly secure platform that will make working easy. Sand wood without slipping, drill holes with professional style accuracy, paint without errors or redoing it to get the perfect finish, and so much more. When you don't have to worry about stuff moving around, or running away on you while you are working, it is much easier to complete the task. 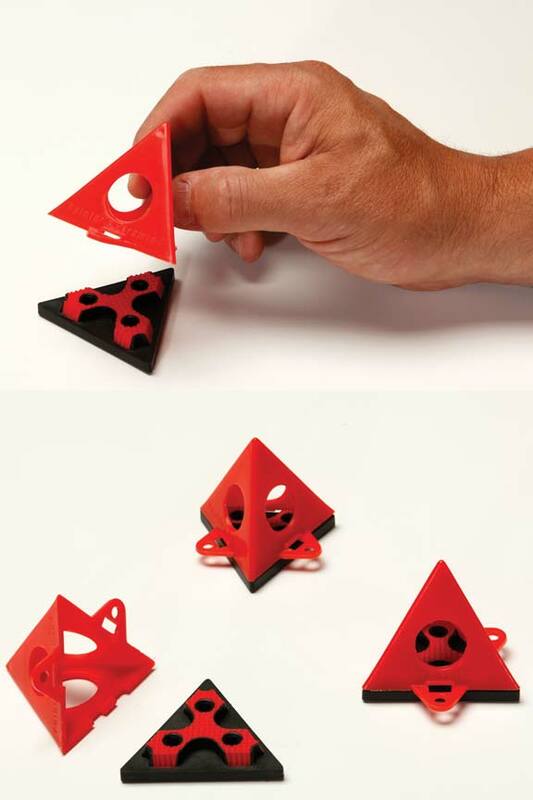 These simple little triangles will quickly become your favorite addition to your tool collection as you begin using them for more an more jobs. Order Yours Today! 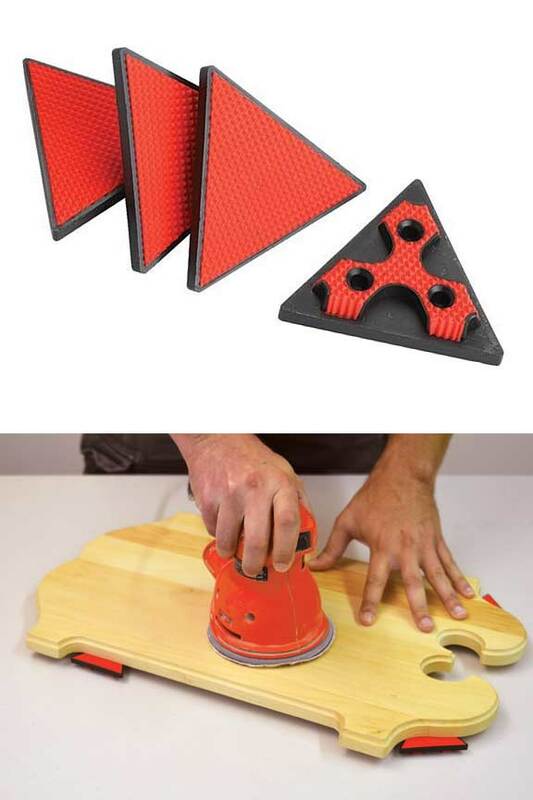 I bought these to keep my cutting boards in place, they work perfectly. My new wooden cutten board wasn't that heavy and was sliding all across my marble counter top. These four little grabbers go under each corner of the board and the board has completely stopped sliding. And the grabbers don't leave any kind of marks on the marble underneath. Great Product-Highly recommended and of course so reasonably priced how can you not try it? I am so pleased with these Grabbers. I had tried everything I could think of to keep my cutting board from sliding all over my counter. They are the perfect size and they provide just enough space between the board and counter. Thank you for a wonderful product. I use these under the corners of my cutting boards so they don't slide across my countertop. I know there will be other uses -- and for now this is enough. Can you attach them permanently? With slight modification, this should be possible. I have a recliner chair that slips back when I get up. Would one under each leg help stabilize this chair? Yes. It sounds like it should do the trick.